@Marcel-Neculae there's a clue in the name of the business. I actually thought that someone managed to get a vendor that would print out a full dock cheaper than the official ones. @Marcel-Neculae when did 3D printers start printing electrical components? If you price up the parts, in bulk, you will see that docks can be made available for a nominal sum. I'll be following and if your test boards come in and work well; I'll likely pick up a few as well the BOM list later. I'll try to but a BOM but since it's just really few components and connectors I didn't thought it may cause trouble. @Charly86 Agreed.. Since the components are common and the count low; I'm sure it could be deduced. i placed order for the 2 sets. it seems it will be several weeks til they arrive, i already placed an order for the female headers 2mm pitch 16pin. it would be great to see a suggested list of the other components like the caps and resistorsw, maybe a regulator, or even better a completed unit. 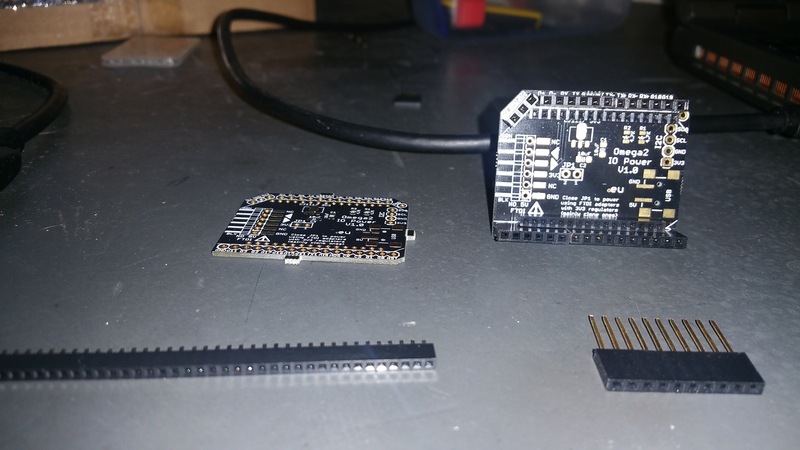 This week I received both of Charles boards which he kindly uploaded at PCBs.io. After soldering the parts on several, I am here to say these benched tested fine with my Omega and Omega2s. 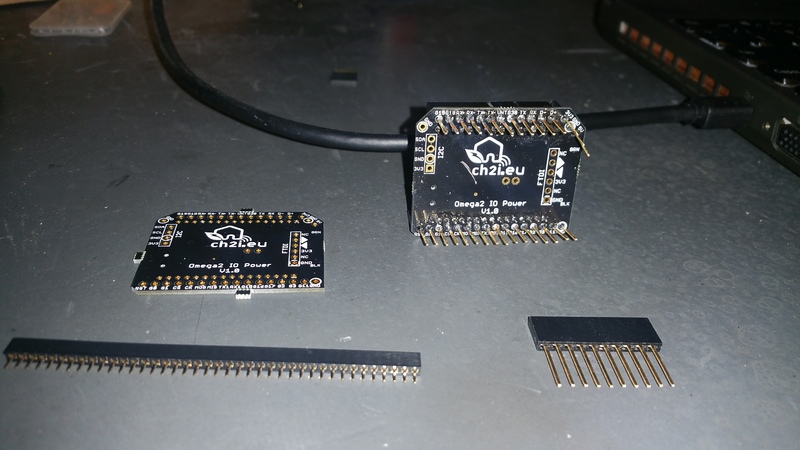 If you are frustrated by the Omega's 1/10" pin pitch which is breadboard incompatible, or you have 1st gen Mini docks that don't work with your Omega2, or Onion is still sold-out of docks then these could be the right docks for you. These are bare boards, so you will be soldering some parts - basic functionality comes with soldering just the headers on the board. A USB to TT UART connected to my PC via a USB cable is all I needed this weekend to power an Omega for reprogramming and testing. With the UART I also have the useful serial connection to the Omega. To power the Omega with a USB power wart, I soldered on the regulator and several caps required to step-down the USB 5V to 3.3V. Those 0805 caps are a bit small - no larger than this "t" you just read on your screen! The 4.7K resistors for the I2C pins are even smaller. These parts can be soldered by steady hands with fine tweezers, a very fine tipped soldering iron and some practice. If you want a dock with a full-sized USB socket then WereCatf's board design may be better for you. I have these boards. They are great! So, the parts-- I didn't populate any of the internal parts, I am just using the traces from the 2mm holes to the 2.54mm holes. So far so good. The parts I did solder in were 2mm headers sourced from Amazon which just came in handy. And stacking 2.54mm headers also from Amazon. I used smaller ones and had to sand the ends to get them end to end (I used a 10 & a 4 on one side and two 6 hole headers on the other. You have to sand between or else there is too much plastic between them). Buy the longer ones from Adafruit and trim one side(no sanding). When checking your conductivity and verifying 0 ohms between the Omega Pins and the stacking header pins-- realize that the power pins are at a 45 degree angle and you'll have to look at the diagram. After that all the pins are nicely labeled by the silk screening on the PCB depending on how good your eye sight is. Go light on the solder so you don't have it bleed into the stacking header socket side. Lastly it is a tight fit all around. The Omega 2 barely fits in between the stacking headers. 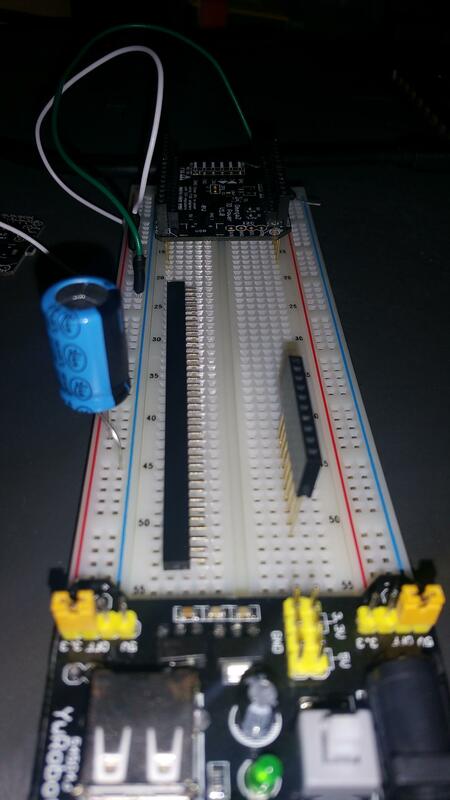 Then when you get it assembled, the whole thing doesn't fit as well as one might hope into the breadboard-- the headers on top come in awful handy.